ANSWER LA is proud to host the Los Angeles stop for the film and speaking tour on the struggle on Jeju Island, Korea, against environmental destruction and predatory war plans by the U.S. Navy. Come see this important and informative film, and hear first-hand accounts from peace activists Hee Eun Park and Paco Michelson. They are traveling across the U.S. to share the story of the struggle by speaking about their personal experiences on Jeju Island as peacekeepers. 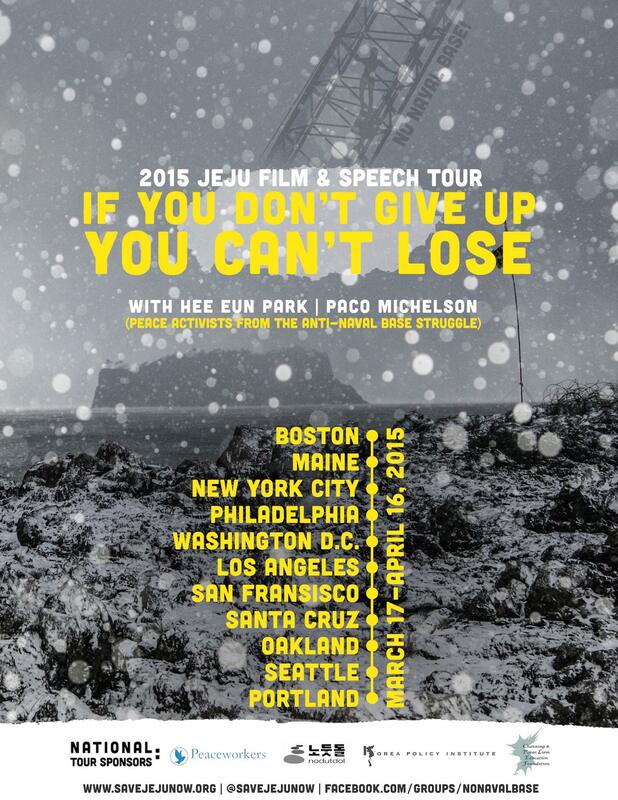 "If You Don't Give Up You Can't Lose" is a film showing the desperate struggle of Jeju Island residents to prevent a naval base from being built nearby and destroying the beautiful scenery of the World Natural Heritage site. Since 2007, the people of Gangjeong and their supporters have struggled everyday against state violence, corporate power, war profiteering, and environmental destruction. They have done so nonviolently and passionately. As a result of their work for peace, the tiny village of Gangjeong now has one of the highest “crime” rates in all of South Korea. More than 220,000 police officers (as of 2012) have been stationed in Gangjeong. So far, more than 700 arrests have been made, leading to approx. 200 court cases for more than 650 people, approx. $270,000 in fines levied, and 46 imprisonments. More than 30 internationals have been blacklisted, deported, or denied entry. All for the “crime” of peacefully resisting the construction of a naval base that threatens villagers’ livelihoods, the local ecology, and the peace of northeast Asia.